According to Ravi Bhandari, Assistant Manager, Research and Consulting, 6Wresearch,” Currently, utilities segment has captured majority of the market in Europe as installations of energy storage systems at large solar or wind farms require high capital investments and the payback period of such large systems is also high. With ambitious plans to introduce millions of electric and hybrid electric vehicles in Europe, the energy storage systems market is likely to grow with a double digit growth rate during 2017-23. “Germany and the United Kingdom are the two biggest markets in Europe for Energy Storage Systems due to increasing tenders for energy storage and rise in electric vehicle usage” Ravi further added. According to Akash Jain, Research Associate, Research and Consulting, 6Wresearch, “At present, lead acid batteries dominate the market. However, their market share is likely to decline dramatically and lithium-ion batteries would take the lead by 2020 as lithium-ion batteries have several advantages over lead acid batteries such as high recycling capacity, higher efficiency and low cost. Due to increasing installations of Concentrated Solar Plant (CSP) in countries such as Spain, thermal energy storage would also witness growth in the forecast period. “The residential and commercial & industrial are other application areas that would register growth in the forecast period due to subsidies offered by government for installing storage systems and increasing electricity prices” Akash Concluded. 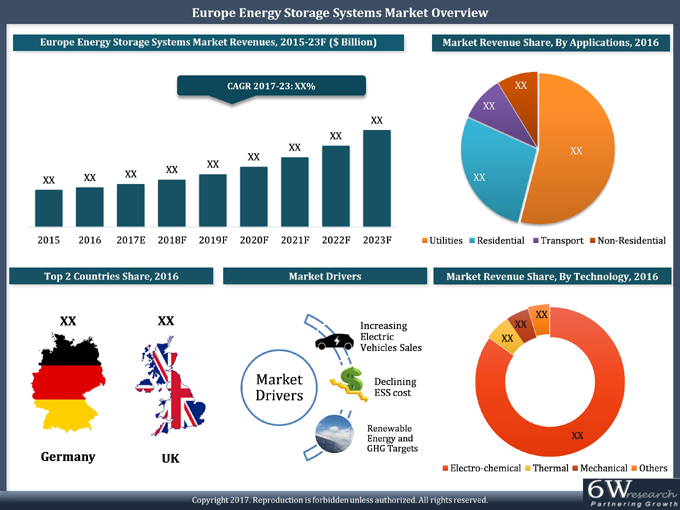 “Europe Energy Storage Systems Market (2017–2023)” provides in-depth analysis with 108 figures and 7 tables covered in 167 pages. The report estimates and forecast the overall Europe Energy Storage market by revenues, technologies, applications such as residential, non-residential, power utilities and transportation as well as by countries. The report also offer insights on competitive landscape, companies benchmarking, company profiles, market drivers and restraints.